Indeed so, indeed so. Rather irritatingly though, Ringway 2 is also known by its "previous" name, the C Ring. So where's this one supposed to run? In simple terms, it's an upgrade to the North and South Circular Roads (A406 and A205), plus a replacement for the Woolwich Ferry in the east, which currently links the two halves of the Circulars on that side of London. Yes, that's right, a ferry. You know, two boats that each carry about 20 cars at a time. It's great fun, and free, but it's ridiculously slow and low capacity. The North Circular's not bad - but there's a reason for that. Perhaps not surprisingly, Ringway 2's northern section was a plain upgrade of the A406, and since the 1960s, a lot of work has gone on with upgrading the North Circular - and a lot of it appears to be slightly watered-down versions of Ringway 2. However, the eastern end of the North Circular road is slightly different. The section south of M11 was originally planned to be the M15 motorway, and indeed a tiny section of the motorway was completed before the whole plan came crashing down, and the section south of M11 is again, a watered down version of M15. Aha! 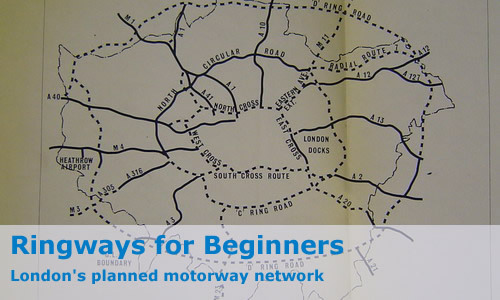 So the number for Ringway 2 was M15 then! The M15 number was definitely allocated to that section of Ringway 2 between M11 and A13. There is no evidence found at this point for that number being used anywhere else - not even for the Thames Crossing to replace the Woolwich Ferry. How about the A205 South Circular? The South Circular is rubbish. I mean, really, really rubbish - full of traffic lights, and places where you need to turn to stay on the Circular and so on. You just can't do anything with it. So, the Ringway planners didn't try. Ringway 2 in the south was to take a different route to the South Circular, slightly further out of the centre. The problem with that was quite simple - Ringway 2 needed to head through suburbia, demolishing everything in its path. Needless to say, it wasn't the most popular idea ever conceived, and the furore caused went a long way towards the eventual abandonment of the Ringways as a whole.